The promotion is in form of a five-course set menu – consisting of two appetizers, two main courses and one dessert. Diners can choose between vegetarian and non-vegetarian fare. 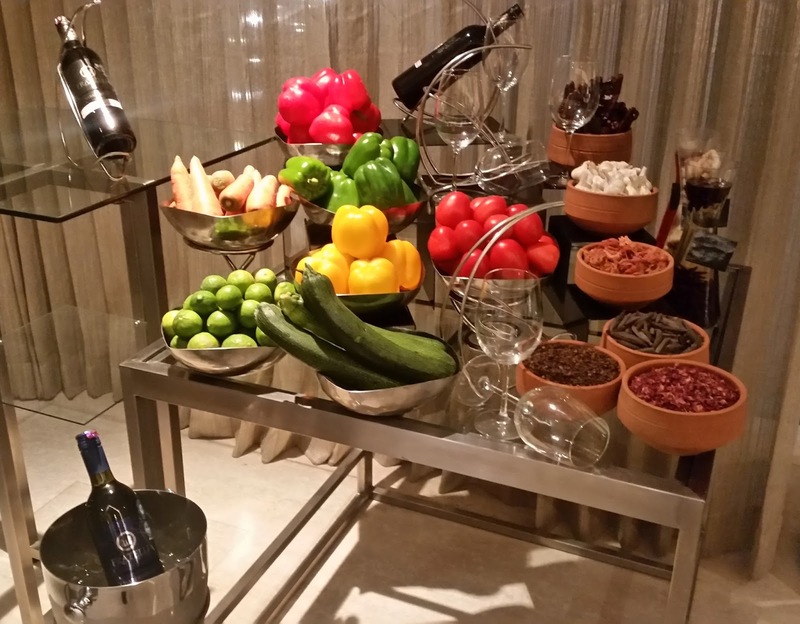 The food menu has been curated carefully for pairing with three select wine labels from the Fratelli stable. Fratelli, the brand from Solapur Maharashtra have been making quite an impression in the Indian wine scene. Apart from the usual grapes going into their regular brands, the vineyard is cultivating some special grapes like Chardonnay and Sangiovese for the first time in India. A sit-down preview of the promotion was organized by the hotel for select members of media and the blogging community. Based on my previous experiences at Cayenne, I have become a fan of Executive Chef Vinay, both in terms of taste of the food he serves, as well as the food styling he does. So I was really looking forward to this event. We started with Fratelli Chardonnay, the white wine made from the French grapes grown at their own vineyard. 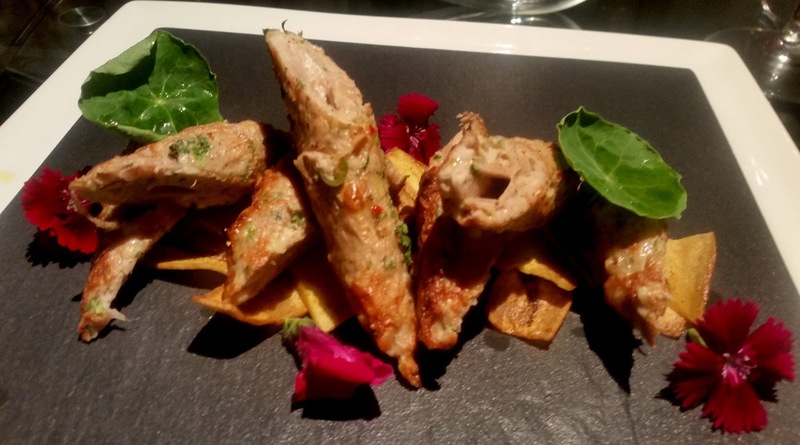 There was some interesting finger food on the table which went famously with the sour and mineral taste of the wine. 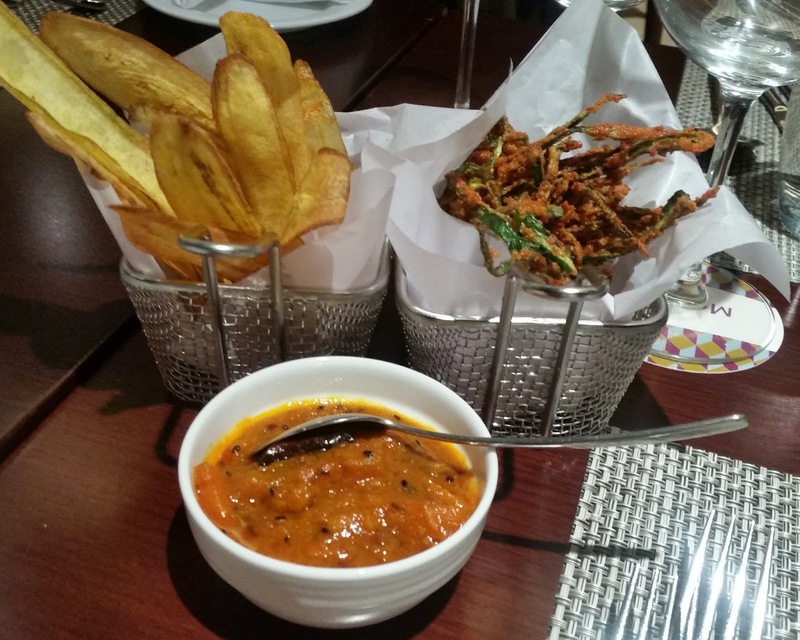 I am not a huge fan of Plantain Chips, but the ones served here were thinly sliced and did not have any excess oil. The Bhindi Kurkure or thinly chopped okra fritters were simply delightful, especially with the Chef’s Homemade Pickle which accompanied it. There were four appetizers in the set menu. 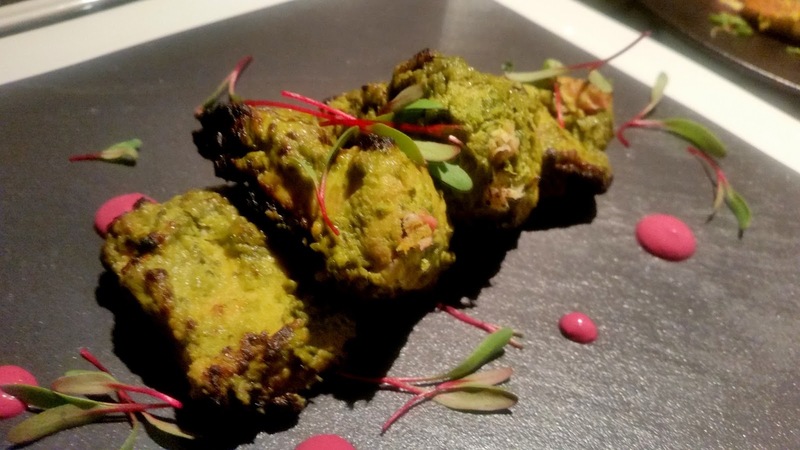 The first was the vegetarian Hara Gobi Ki Tikki, a patty of broccoli, potato and spring onions. 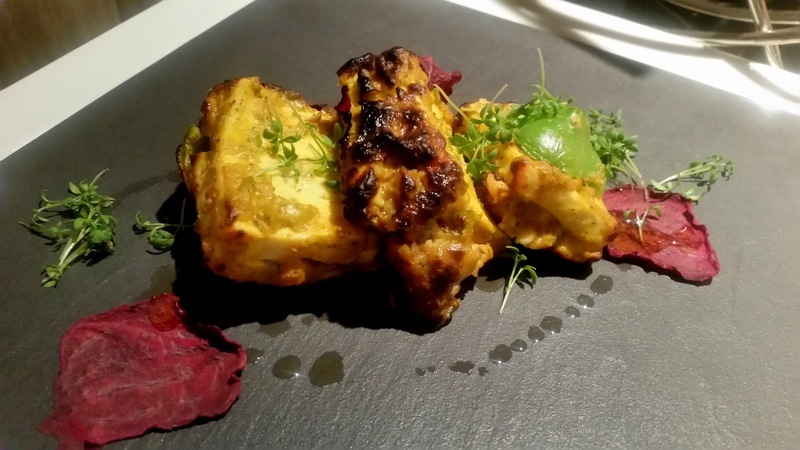 This was par for the course, but my favourite was the next dish, the succulent Peanut Paneer Tikka. The marinade had quite a hint of cardamom enhancing the taste of the dish and providing an ideal foil to the wine. Gilafi Reshmi, a chicken and cheese seekh kabab was soft and tasty, though a tad dry. Haryali Machhi, red snapper in a perfect green masala of dhania, pudina and chillies was simply outstanding. By this time we finished with the starters, the second wine Fratelli Sangiovese was served. Purple Sangiovese grapes are popular in Italy and originally from Tuscany. The red wine served was sweet and slightly acidic. Fratelli also has a white wine Sangiovese Bianco from the same grapes. The main courses were paired with the red wine. 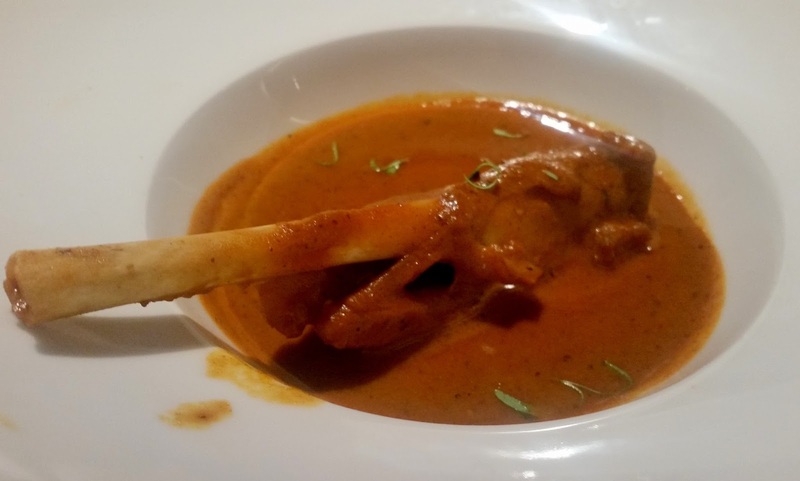 Nizami Shank, a slow cooked lamb preparation from Hyderabad was served with Butter Naans. The spice-laden dish was an ideal combination with the acidic red wine. The other non-vegetarian dish, Duvari Murgh Tikka Masala, a smokey flavoured Punjabi tomato based gravy preparation was quite decent too. 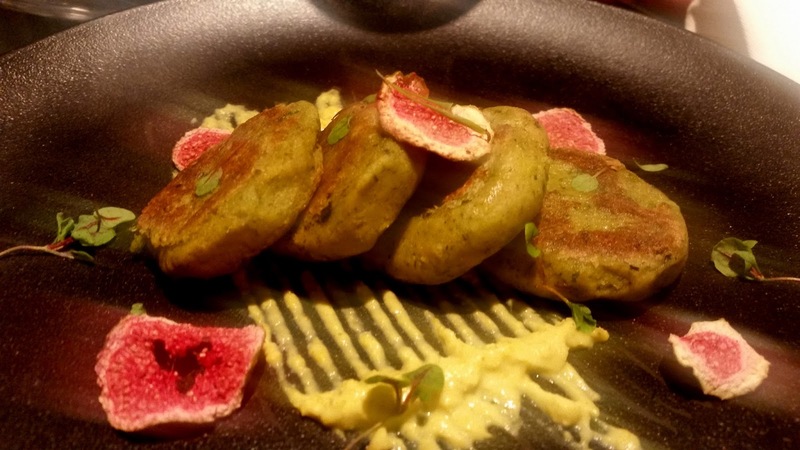 Among the veg main courses, Anjeer Malai Kofta was a cashew based gravy with subtle flavours. Though I am no expert in pairing, in my opinion, it did not work well with the wine. 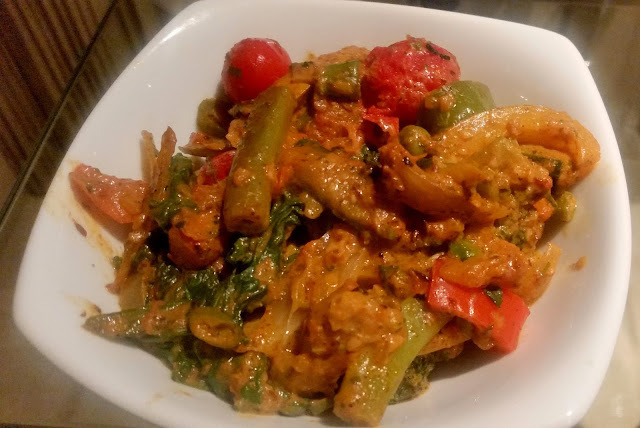 Bilati Sabzi, a mixed vegetable dish was a clear winner. The third wine served was the popular Fratelli Sauvignon Blanc, which is possibly the most popular grape family for white wines. 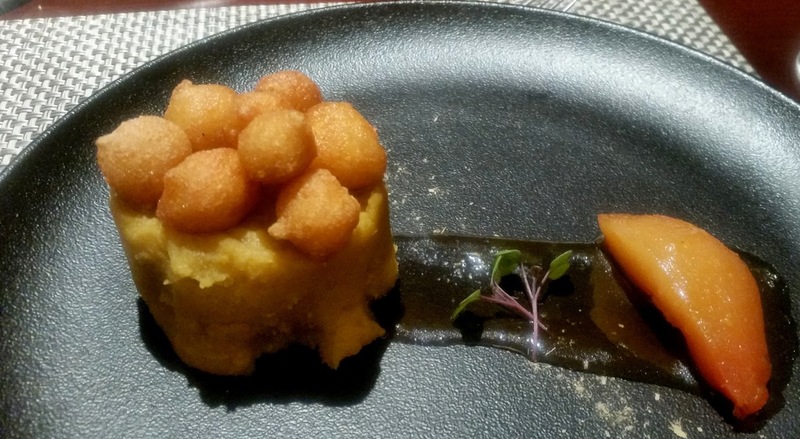 The dessert was exquisite, something I had tried in Cayenne before. A deconstructed version of Poornalu had the fillings served as the base topped by balls of rice flour, which is usually used in the outer layer of the sweet. This was accompanied by a fine piece of poached pear. I do not have much of a sweet tooth but found that the dish was appreciated by one and all. The unlimited set menu with wine is priced very attractively at Rs 1799 all inclusive. The promotion is on till 15th December only for dinner. If you love good food and wine, this is one festival which is not to be missed.